Fantasy Hockey Stock Report: Are the good days over for the King? This week's article includes the second center in Boston, a diminutive winger on fire in the Windy City, a young netminder in Florida, Pasta on the verge of return, and Kovy finishing off a nightmarish return to the NHL. Krejci continues to rack up points, notching an assist in Boston's 2-1 win Saturday. That helper gave Krejci 44 to go with 19 goals in 72 games this season. He has been especially hot since the calendar flipped to 2019, posting 12 goals and 21 assists in 33 games. Krejci is the perfect second-line center in the Hub, aided by the presence of Patrice Bergeron in the black and gold. Johansen is not the center you need if you want goals in your league. But if you need assists, he is clearly your man. With 11 markers on the season, R-Jo will finish with less than 20 goals for the fourth consecutive season. Johansen, though, has already notched 46 helpers, the fourth time in five seasons he has posted at least 45 apples. With Viktor Arvidsson and Filip Forsberg converting his dishes, Johansen should top 50 assists. Boeser has nicely built off his excellent rookie campaign. After scoring 29 goals and 55 points in just 62 games to lead the Canucks in scoring, Boeser has 23 goals and 27 assists this season. Boeser, a first-round pick in 2015, has two goals and six helpers over a seven-game point streak through Monday's games. With Boeser, Elias Pettersson and Quinn Hughes in Vancouver, the Canucks have solid building blocks for the future. Hoffman added to his career-high goal total, notching his 33rd marker of the season Saturday. Add in 31 assists with more than half — 33 — of his 64 points coming on the man advantage, and it's been a very productive first season for the left winger. The one negative is his minus-20 rating, matching his number from Ottawa last season. But his scoring output largely outweighs that issue with seven goals coming in his last 12 games. 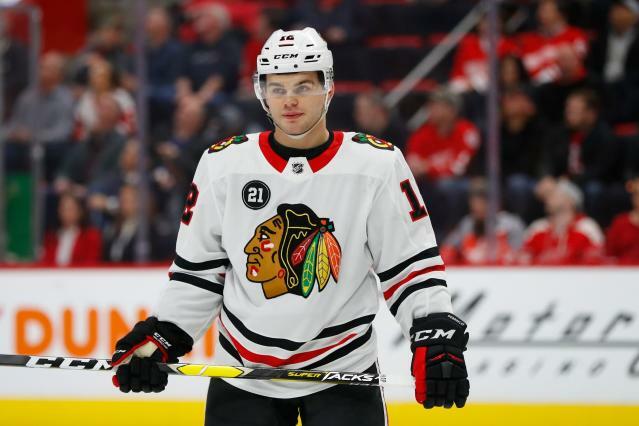 DeBrincat burst on the scene with 28 goals, leading the Blackhawks as a rookie while totaling 52 points in 82 contests. He is making last year look like a pauper's production, posting 38 goals and 31 assists in 70 contests. DeBrincat saw his four-game, six-point streak that included four assists end Monday, but he should finish the season with more than 40 goals. Pretty good for a 5-foot-7, second-round pick in 2016. Disregard the plus-minus, if you can, and just focus on the offensive production from Severson. With 11 goals and 26 assists, Severson has established a career high in points. He is just three assists and four power-play points from setting highs in those categories. Severson still struggles in his own zone, an age-old issue with him, but with that level of production along with possibly close to 100 hits and blocked shots by year's end, he warrants a place in your lineup. Rielly's magical campaign continued Saturday, as he became the first blueliner in the league to notch 20 goals. With that number of goals along with 48 assists and 68 points, Rielly has set career highs in each category. A few years ago, the belief was that Rielly might be transitioning to becoming a shutdown defender, adversely impacting his offense. That view is clearly no longer the case, as he has blossomed into an offensive weapon from the back line. Montembeault picked up his fourth straight win while starting his fourth consecutive game Saturday against the Kings, but took the loss Sunday, allowing three goals on 22 shots. With Florida all but playing out the string, it behooves the Panthers to keep rolling out the young netminder to see if he could be their back up next season. Montembeault, in those five games, has allowed 11 goals on 124 shots on net. A 22 year old in the final year of his entry-level contract, Montembeault likely will be re-signed by the Panthers, who then will need to figure out what to do with James Reimer and Roberto Luongo, each of whom have at least two years left on their deals. Others include Evgeni Malkin (1,000 points), Aleksander Barkov, Sean Couturier, Steven Stamkos, Connor McDavid, Dylan Strome, Logan Couture, Dylan Strome, John Tavares (first 40-goal season), Patrice Bergeron, Mark Scheifele, Tomas Hertl, Matthew Tkachuk, Filip Forsberg, Jared McCann, Brandon Saad, Jakub Vrana, Claude Giroux, Nikita Kucherov, Viktor Arvidsson, Pavel Buchnevich, Blake Coleman, Brett Connolly, Jake Guentzel, Jakob Silfverberg, Brad Marchand, James van Riemsdyk, Oliver Ekman-Larsson, Keith Yandle, Charlie McAvoy, Shayne Gostisbehere, John Carlson, Jake Muzzin, Dougie Hamilton, Martin Jones, Marc-Andre Fleury, Jaroslav Halak, Corey Crawford, Jacob Markstrom, Petr Mrazek, Andrei Vasilevskiy and Sergei Bobrovsky. During the season, names matter little and production rules. This is especially so down the stretch if you are vying for your league title. Nilsson isn't a big name, but he is hot and belongs in your active lineup. His win over Toronto on Saturday gives Nilsson back-to-back victories over the Maple Leafs and Blues and three wins in his last four starts. Ottawa is far from the strongest team in the league, but roll with Nilsson while he is hot. Pasta, out with a left thumb injury suffered on his way from a sponsorship dinner on Feb. 10, skated in Monday's practice and is a game-time decision for Tuesday's game against the Islanders. Prior to suffering the injury, Pastrnak had tallied 66 points — 31 goals and 35 assists — through 56 games, and his absence removed one-third of the stuff line in Boston. The Bruins are in second place in the Atlantic Division and will be more than happy to welcome their sniper back to the lineup. Others include Dylan Larkin (neck strain, returned to action Saturday), Jake DeBrusk (foot, missed five games, returned to action Saturday), Evander Kane (personal, has missed eight consecutive games), Kris Letang (upper body, out since Feb. 23, skating in regular jersey in practice), Torey Krug (concussion, missed Saturday's game), Thomas Chabot (toe, week-to-week), Ben Bishop (lower-body injury, day-to-day) and Robin Lehner (concussion, dressed Thursday, but has yet to play). Turris was a healthy scratch for the second straight game Saturday but should be in the lineup Tuesday. After coming over from Ottawa last season, Turris posted 42 points in 65 games in a Preds uniform, including 17 points on the power play, matching his career high from the previous season. This season has been a nightmare from the get-go. Turris has just 22 points in 46 games, including just four in 16 contests since he returned from a lower-body injury Feb. 6. Kovalchuk has had almost a permanent spot on this side of the ledger. He gets another mention after serving as a healthy scratch Saturday, scoring just a goal and assist with a minus-seven rating his last 12 games. Overall, it's been a tough return season for Kovalchuk, who was back in the lineup Monday, as he's tallied only 14 goals and 16 assists against a minus-25 rating over 59 games after playing five years in the KHL. Add in two more years at $6.25 million per season with no cap relief because Kovy was an over-35 signing, and L.A. has to be regretting that deal. Heiskanen is having a solid rookie campaign, but his production has tailed off recently. The third overall pick in 2017, Heiskanen last scored a goal on Feb. 7. Since then, he has posted just four assists in 17 games. Overall, Heiskanen has 10 goals and 19 assists in 72 games. The future is bright for the young Finnish defenseman, but he likely warrants a place on your bench. Others include Mika Zibanejad, Kevin Hayes, Jonathan Drouin, Joe Pavelski, Filip Zadina, Chris Kreider, Tanner Pearson, P.K. Subban, Linus Ullmark, Frederik Andersen and Jonathan Bernier. As a Rangers' fan, it's no fun including Lundqvist on this side of the column. But his overall play, 2-7-3 in his last 12 games, recently coupled with the team's struggles, warrant that decision. 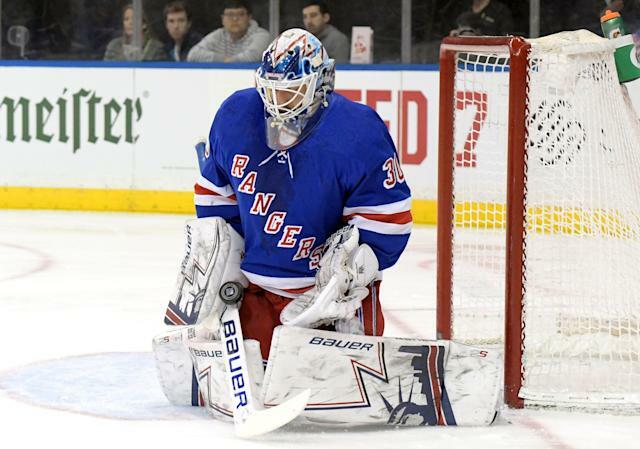 Last season was the first time Lundqvist did not win 30 games in a full year. He will not hit that win mark again this campaign and won't match the 26 victories he notched last year. Add in career-worst marks in goals-against average and save percentage, and it's no wonder why many are questioning whether Lundqvist will ever rebound to even his 2016-17 numbers.